Some of the most common and economical aids are chalk or marker boards, and supplemental print materials, including charts, diagrams, and graphs. Other aids, which are usually more expensive, are projected materials, video, computer-based programs, and models, mock-ups, or cut-aways. Keep the chalk or marker board clean. Keep chalk, markers, erasers, cleaning cloths, rulers, and related items readily available to avoid interruption of the presentation. Organize and practice the chalk or marker board presentation in advance. Write or draw large enough for everyone in the group to see. Leave a margin around the material and sufficient space between lines of copy so the board is not overcrowded. Present material simply and briefly. Make only one point at a time. A complete outline tends to distract students and makes a logical presentation difficult. If writing has been previously prepared, it should be covered and then revealed one step at a time. If necessary, use a ruler, compass, or other devices in making drawings. Use colored chalk or marker for emphasis. Use the upper part of the board. In many classrooms, students may not be able to see the lower half. Stand to one side of the board to avoid hiding the essential information. Use a pointer when appropriate. Adjust lighting as necessary to remove glare. Print media, including photographs, reproductions of pictures, drawings, murals, cartoons, and other print materials are valuable supplemental aids. Charts, diagrams, and graphs are also in this category. Many of these items are suitable for long-term use on bulletin boards and in briefing areas. Pictures, drawings, and photographs are especially effective because they provide common visual imagery for both instructors and students. In addition, they also provide realistic details necessary for visual recognition of important subject material. In many cases, this type of supplemental training media may be reproduced in a format for projection on a screen or other clear surface. Charts, diagrams, and graphs include any printed material which gives information in tabular form. There are several types of charts that can be used in presenting data such as pie charts, flow charts, and organizational charts, among others. The type of chart selected for use depends largely on the type of information the instructor wants to convey. An important factor is chart format. Since charts may consist of a series of single sheets or be tied together in a flip-chart format with several pages, the location and handling of them should be planned in advance. A graph is a symbolic drawing which shows relationships or makes comparisons. The most common types are the line graph and the bar graph. The selection of a graph for use in any given situation depends upon the type of information the instructor wants to convey. Charts, diagrams, and graphs can be used effectively to show relationships, chronological changes, distributions, components, and flow. They are easy to construct and can be produced in the same manner as pictures. In addition, they can be drawn on a chalk or marker board and can be duplicated. Care must be taken to display only a small amount of material and to make the material as simple but meaningful as possible. Numerous other useful print items may be considered as supplemental training aids. Some of these include study guides, exercise books, course outlines, and syllabi. Well-designed course outlines are especially useful to students because they list the key points and help students organize note taking during a lecture. Aviation instructors must cover a broad range of aeronautical knowledge and skill training for pilots and AMTs. The actual training requirements are based in the Code of Federal Regulations (CFR) and other publications used by designated pilot and maintenance examiners when they conduct practical tests. While aviation instructors are expected to be familiar with all regulatory training requirements, use of instructor-oriented training materials which are enhanced for regulatory compliance can be very beneficial for ensuring required training is being accomplished, endorsed, and properly documented. Whether working as an individual instructor or employed by a flight or maintenance school, the instructor must ensure that each student accomplishes a number of important benchmarks. Enhanced training materials that include these benchmarks can help aviation instructors complete, endorse, and document required training. For example, the training syllabi represent enhanced training material and contain provisions for instructor endorsements and recordkeeping. Such syllabi not only present the course of training in a logical step-by-step, building block sequence, they contain provisions to remind both students and instructors of critical regulatory training benchmarks which are approaching. Blocks for instructor endorsements also may be included at appropriate points. Provisions for logging training time can be incorporated so the syllabus could also serve as the training record for the student, instructor, or school. When required endorsements and recordkeeping provisions are designed into training syllabi, it is much easier, from the instructor’s standpoint, to conduct required training, track student progress, and certify records. The training record can be reviewed and the student’s training status easily assessed in case the student transfers to another school or instructor. Another example of enhanced, instructor-oriented material for pilot training is a maneuvers guide or handbook which includes the PTS as an integral part of the description of maneuvers and procedures. Students learn from the beginning how to perform the maneuver or procedure and also become familiar with the performance criteria. Instructors need not refer to another document to evaluate student performance. The examiner for the Airframe and Powerplant (A&P) is required to ask four questions in each of the subject areas, which are required by the regulations to be taught. The examiner also is required to assign a practical project from each subject area. Individual maintenance instructors, as well as publishers, have compiled lists of typical questions and projects. Use of these questions and projects as part of the syllabus helps an instructor ensure that all subject areas for a particular class have been covered. There are many ways to incorporate design features in training materials in order to facilitate regulatory compliance, required endorsements, and record keeping. Computer-based training also can be designed so the progress of the student can be tracked and documented. As training becomes more detailed and complex, instructor-oriented materials can be a valuable instructional aid for aviation instructors. Traditional aids in this group include slides, filmstrips, and transparencies for overhead projection. In recent years, video (VHS, compact disks (CDs), digital video disks (DVDs), or computer files), and computer slide shows incorporating text, graphics, video, and animations, have pushed aside traditional training aids. Whatever type of projected training aid used, it is essential for the content to be current and support the lesson. Use of projected materials requires planning and practice. The instructor should set up and adjust the equipment and lighting beforehand and then preview the presentation. During a classroom session, the instructor should provide students with an overview of the presentation before showing it. After the presentation, the instructor should allow time for questions and a summary of key points. Computer-generated slide shows have changed the way information is presented to today’s student. While a computer, screen, and projector may be needed for the classroom, a laptop computer may be all that is needed for the one-on-one presentation. These slide shows can be only bulleted information or incorporate animation and video clips. The instructor can tailor the presentation for the class and also include graphics at appropriate points. A wireless mouse can be used to activate the slide changes from anywhere in the room. Another convenient and cost effective instructional aid is the overhead transparency and projector. Instructors can create their own overhead acetate or plastic transparencies, or they may purchase commercially produced ones. Material composed on a computer word processing and graphics program can also be printed onto transparencies. The equipment can be placed at the front of the room, allowing the instructor to maintain eye contact with students. [Figure 4-18] The brilliant light source concentrated at a short distance makes it possible to use the projector in lighted areas. The instructor also can write on a blank transparency as the lesson progresses, much like a chalk or marker board. Additional transparencies can be overlaid onto the original to show development or buildup of an event or display. Overlays can also be cut into various shapes and moved about in relation to the base transparency. This is a useful technique for displaying dial indications or fitting several parts of a component together so relative motion can be simulated. Figure 4-18. Interior of a lecture room designed for trainings with enhanced training materials utilizing projection equipment. 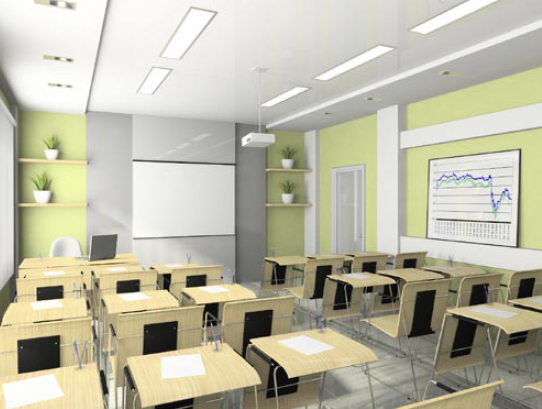 With any projection equipment, instructors should ensure the projector does not obstruct the students’ line of sight. The projection angle should be adjusted to eliminate image distortion. Finally, although the overhead projector is simple to operate and requires little maintenance, it has disadvantages. Most projectors are bulky to handle and store, and the projector cooling fan may be noisy. Although vastly different from other projection equipment, the opaque projector reflects light from the surface of the picture or three-dimensional object onto a regular projection screen. The height of usable objects is limited to the space between the top of the lowered projection plate and the body of the projector, usually about two or three inches. The area of the picture or object is limited to approximately 10 inches by 10 inches. Items which may be projected are practically limitless. A postage stamp, typed material, textbook illustrations, or a defective spark plug are representative of the items that may be projected. This equipment is especially adapted to enlarging diagrams and small charts for display purposes. Since the material projected requires no special preparation, the cost is very low. Many of the limitations of the overhead projector are also true of the opaque projector.